The Almo Nature product range includes not only cat food but also tasty cat snacks with meat. 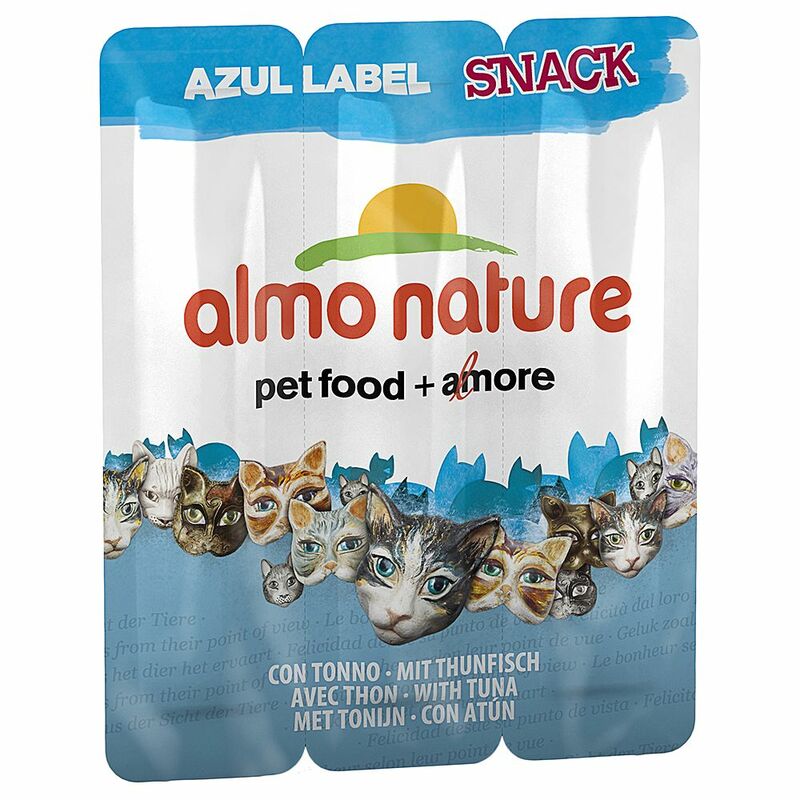 Almo Nature Azul Label cat sticks are a real treat for your cat. The sticks are individually packaged so that they are always fresh. Great tasting and perfect as a treat or as a snack in between meals. Almo Nature cat sticks are made from premium meat or fish, with carefully selected and proceΒed ingredients. No artificial additives have been used. Almo Nature Azul Label Cat Sticks at a glance: 3 cat snack sticks - each 5g and individually packaged Made from tasty chicken or delicious tuna No chemical additives Supplementary food for cats Almo Nature cat food is unique and delicious, like all natural things. Almo Nature – from your pet's point of view! Almo Nature cat snacks are entirely natural. Every single flavour of Almo Nature Azul Label Cat Sticks (tuna, chicken) contains its own proportions of vitamins, minerals (e.g. calcium, phosphorus) and taurine. Almo Nature therefore recommends a diet which is based on a variety of different natural foods (red meat, poultry, and fish, dry and wet food). The varying nutritional content of different foods will ensure a balanced diet for your cat.